O.P.O. Bellaguarda s.a.c., located in Viadana (Lumbardy), achieved great results in melon conservation thanks to new air purification system Bio Turbo. Produced by US company Miatech, Bio Turbo is an innovative system for post-harvest phases, and Natural Misting is the exclusive importer for the Italian market. Bio Turbo is a brand new technology for early ripening prevention, ideal to prolong the shelf-life of fruit and vegetables and avoid damage caused by bacteria and mould. The equipment uses a patented process divided into four stages that effectively remove ethylene and 99.5% of bacteria (click here for further info). The ozone used in one of the four phases in never released inside of the cold storage unit, making this new technology completely safe for humans and making storing procedures and quality checks simpler. "Stored melons remain fresh. In addition, waste caused by rot or mould has been drastically reduced. In fact, thanks to the Bio Turbo system, the air in the unit is continuously purified and the ethylene produced by ripening products is immediately destroyed, so the shelf-life is longer and melons remain healthy and fresh," explains Gabriele Poma, warehouse manager of O.P.O. Bellaguarda. Bio Turbo also sterilises the air in the fresh-cut laboratory, reducing the cause of infections which could lead to the deterioration of the product. 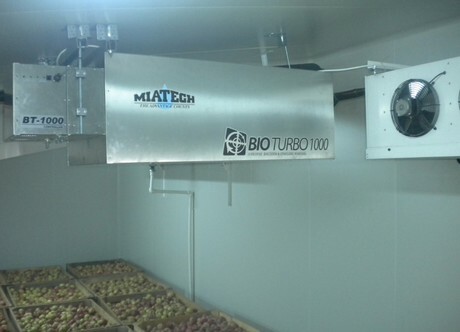 As Natural Misting representatives explain, "in the washing, cutting and packaging area for the preparation of fresh-cut products, the Bio Turbo 1000 system was installed (filtering up to 1,000 cubic metres in 24 hours), whereas in one of the storing units Bio Turbo 6000 was installed (up to 6,000 cubic metres filtered in 24 hours)." The Bio Turbo system can be seen at the top. Mr. Gabriele Poma, warehouse manager of O.P.O. Bellaguarda, assists melon and watermelon cutting. Paolo Sarzi Maddidini, director of O.P.O. Bellaguarda, is particularly satisfied because the purification process and the destruction of ethylene are obtained without filling the atmosphere with gases, so operators can safely work inside the unit. Experiments on melons will go on for around 40 days until the end of the melon production by O.P.O. Bellaguarda members.